A year ago I wrote a piece for this Web site (titled “Why Climb a Mountain?”) about the publication of the seventh edition of my father’s 50 Hikes in the White Mountains. 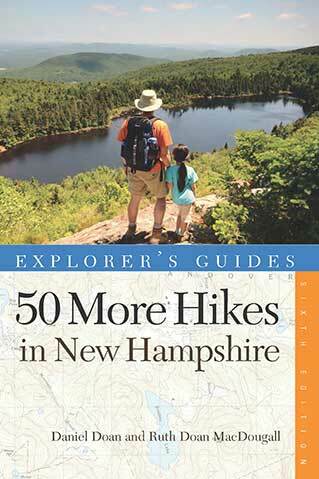 This year brings the publication of the sixth edition of its sequel, 50 More Hikes in New Hampshire. Blueberries in June? To a man from central New Hampshire, June is early for blueberries. Although later he’s accustomed to extending the season by going farther north and upward in the mountains, he thinks finding blueberries during strawberry season is too much luck for his own good. Nevertheless, I ate blueberries on Middle Barrett one recent June 22 and at home the same day picked strawberries for supper. The universal reaction at the instant of stepping out on the rock is awe blended with delight (usually indicated by an involuntary gasp). The impact lingers in your memory. It’s not the scenery alone; it’s the power underlying our green and stone-ribbed world. The forest is spacious and lively with migrating birds. A myrtle warbler, yellow, white, and black among a shadbush’s white-lace flowers, can make you a lifelong birdwatcher. The seasons reverse themselves as you climb. Early spring surrounded you at the start along Tecumseh Brook. There all kinds of plants were rushing to airy life after a winter protected by fallen leaves. Now at 3,000 feet, late winter encloses you. But pause and look back so you’ll fix this section in your mind for the return trip. Heedless hikers, having lingered overly long at the falls, have been know to hurry inadvertently into the little clearing and then take a false trail leading only to the bosky wilderness. The Pemigewasset Wilderness flames no more with the lumberman’s forest fires but annually burns symbolically with the red leaves of swamp maples in the lowlands. The mountainsides display the yellow of birches, the tan of beeches, the orange of sugar maples, and the lemon of poplars. Campfires, as Thomas Jefferson said of liberty, require eternal vigilance. The settlers who declared themselves an independent republic were descended from] the wanderers and the rovers, the explorers, the footloose, the men seeking quick wealth through fur, the men defending their log huts, the men taking to the woods-life as to a drug (pounding heart of the chase and the ultimate freedom, which they could never give up). Over the years, the maps have changed in both books. Originally, the trail routes were simple line drawings. Then in 1991 Dan oversaw the change to “brand-new maps,” said the back cover, “which feature the described trail routes superimposed on sections of government topographic sheets. Unlike the old sketch maps, the method allows the hiker to orient more easily to the surrounding terrain.” Now in the sixth edition of 50 More, GPS coordinates have been added, and elevation graphs! The biggest change in 50 More is the same as in last year’s new 50 Hikes in the White Mountains. Color. The photographs are in color, almost all of them taken by Robert J. Kozlow, including the charming cover photo. It’s a beautiful book.